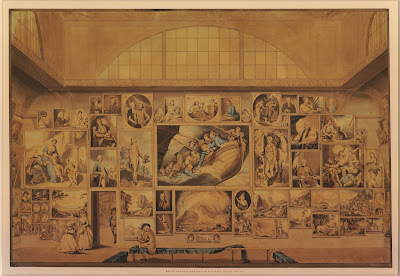 West Wall, The Great Room, Somerset House, the main space of the summer exhibition of the Royal Academy of Arts, 1784, Edward Francis Burney, 1784, British Museum. 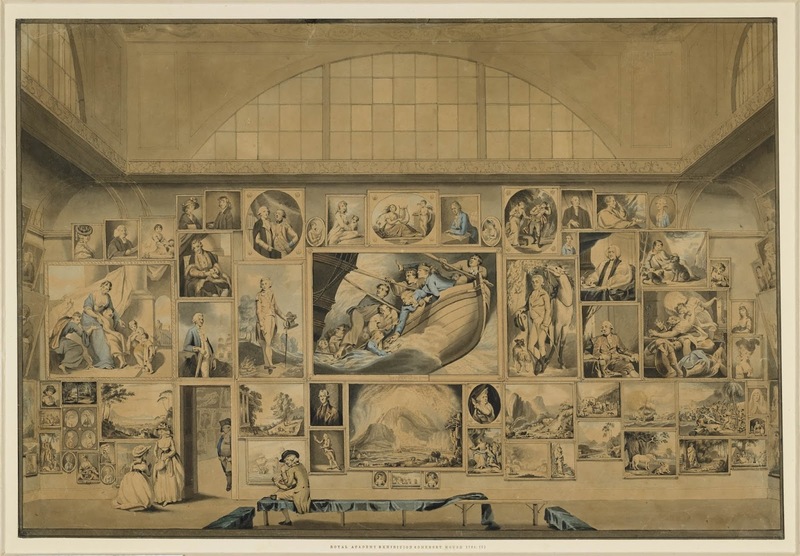 Burney's drawing shows us the centerpiece on the West Wall: James Northcote's 1784 painting Portraits Painted from Life, Representing Capt Englefield with Eleven of his Crew Saving Themselves in the Pinnace, from the Wreck of the Centaur, of 74 Guns, Lost Sept 1782. Northcote was particularly proud of this early work, proclaiming it "the grandest and most original thing I ever did." Unfortunately for us, the original is lost. First, a bit of background. The Centaur began her life as a French warship, but was captured by the British in their wildly successful military operations of 1759, forever remembered as an Annus Mirabilis. From there, Centaur proved a thorn in the side of the French fleet. Centaur chasing the Vaillant and Amethyste, January 1760, artist unknown, eighteenth century, National Maritime Museum. "Frontispiece to book the second: The second cruize of his Majesties ship Centaur off Cape Francois, in the West Indies," artist unknown, c.1761, National Maritime Museum. 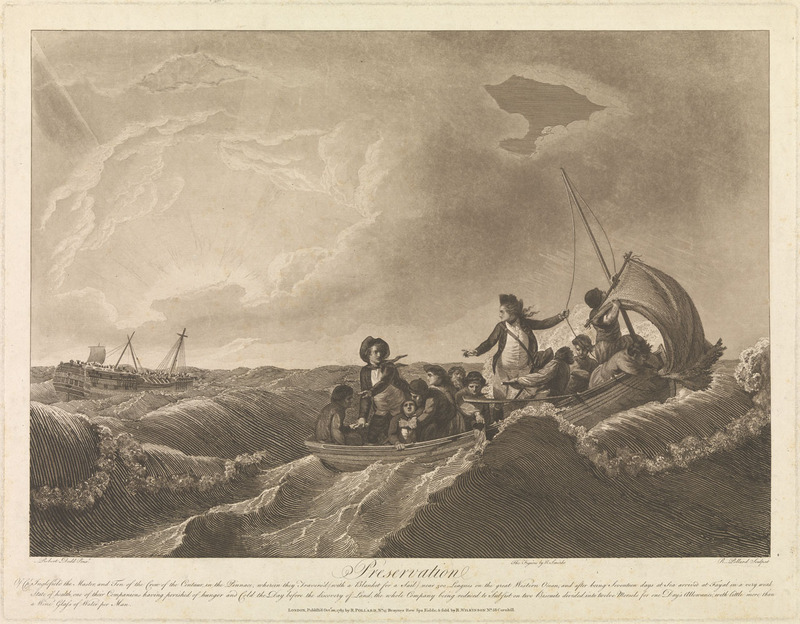 During the American Revolutionary War, Captain Inglefield commanded the Centaur when she served in the van of Admiral Rodney's fleet at the Battle of the Saintes. 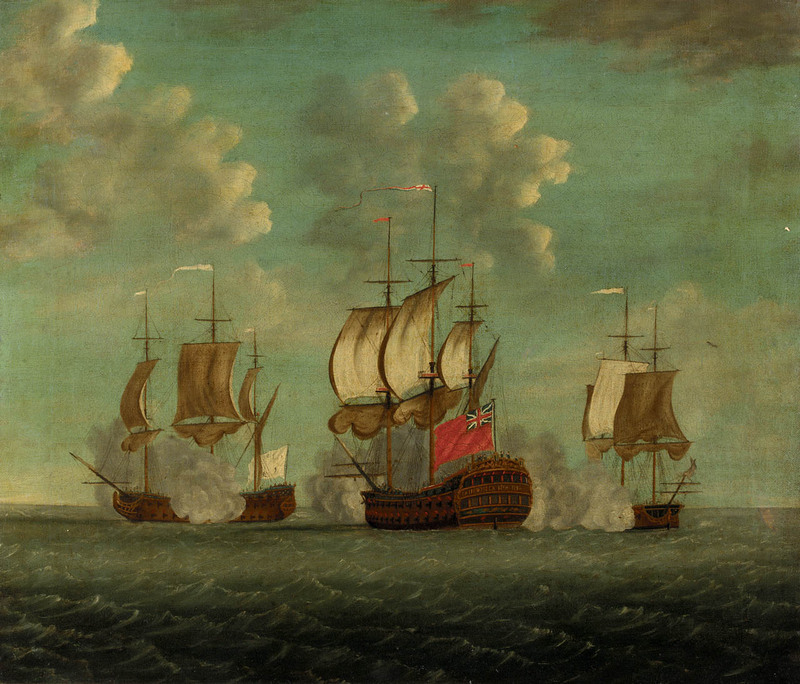 Here the Royal Navy broke the back of the French fleet in the Caribbean. During that famous battle, the French were humiliated by the capture of their 104 gun flagship Ville de Paris and the surrender of the Comte de Grasse. British satirical and historical artists reveled in this stunning victory. Shortly after the battle, Inglefield was ordered to sail in convoy with the captured French vessels and other Royal Navy ships across the Atlantic under Admiral Graves. 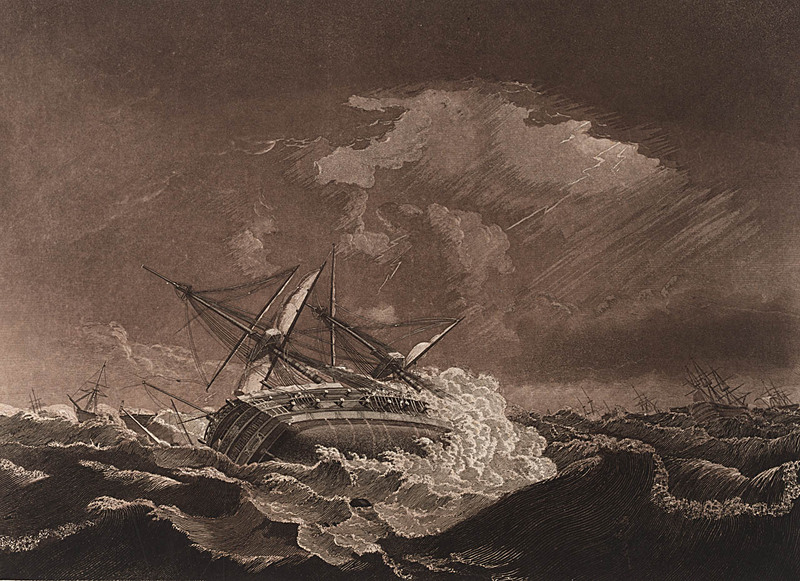 The fleet sailed straight into a massive hurricane. 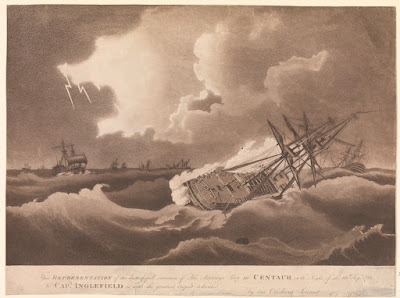 Inglefield himself left us a brief account of his experience in Captain Inglefield's Narrative, Concerning The Loss His Majesty's Ship The Centaur, of Seventy-four Guns. He describes the wind as "exceeding in violence every thing of the kind I had ever seen, or had any conception of." Distress of the Centaur on the Night of the 16th Septr 1782, engraved by Robert Pollard after Robert Dodd, 1783, National Maritime Museum. This Representation of the distressful situation of His Majesty's Ship the Centaur on the Night of the 16th Sept 1782, printed by F. Jukes, date unknown, National Maritime Museum. 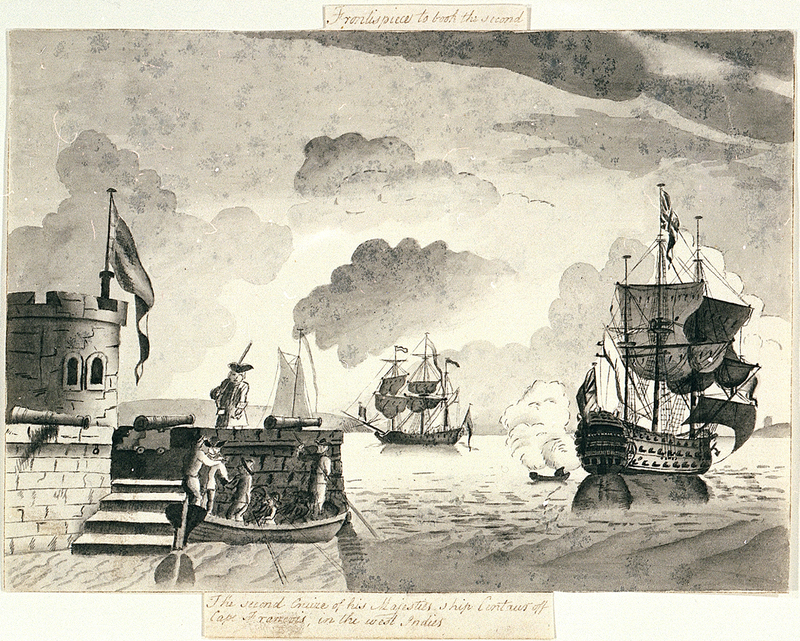 Views of various situations of the Jamaica Fleet, Robert Dodd, 1783, British Museum. Caught in the hurricane, Centaur began to founder. Captain Inglefield knew she was destined to go to the bottom. It was at this critical juncture that he was made aware that the ship's pinnace was being "forced" off the ship by a number of sailors. Facing the philosophical quandary of remaining to die with his men in a gesture or taking to the boat to live, "the love of my life prevailed." 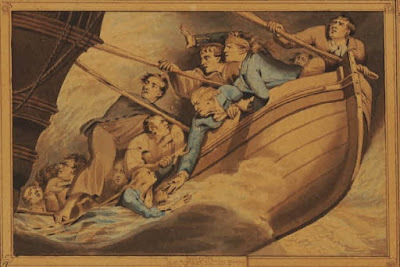 Panicked men poured from the side of the ship in a vain attempt to board the pinnace, including a young midshipman. Mr. Baylis, a young gentleman fifteen years of age, leaped from the chains after the boat got off, and was taken in. 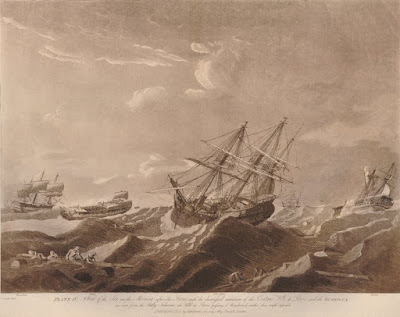 The boat falling astern, became exposed to the sea, and we endeavoured to pull her bow round to keep her to the break of the sea, and so pass to windward of the ship; but in the attempt she was nearly filled; the sea ran too high, and the only probability of living was keeping before the wind. Inglefield, Midshipman Robert Baylis (or Bayles), Master Thomas Rainy, and Captain's Coxswain Timothy Sullivan all managed to guide the overloaded pinnace and her distressed sailors sixteen days over open water to the Azores with the loss of only one man. Preservation of Cpt Inglefield, the Master, and Ten of the Crew of the Centaur in the Pinnace, Robert Pollard, 1784, National Maritime Museum. As featured in this blog post. 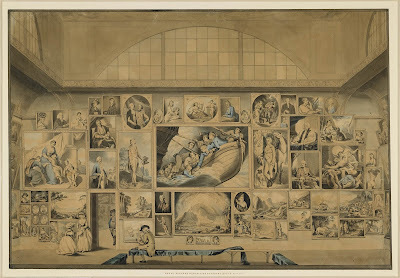 Tomorrow my esteem'd brother blogger at Napoleonic Tars: 1790-1820 examines the surviving prints of James Northcote's masterpiece and the clothing of the survivors.